Mike A. Wins The PGA Championship! 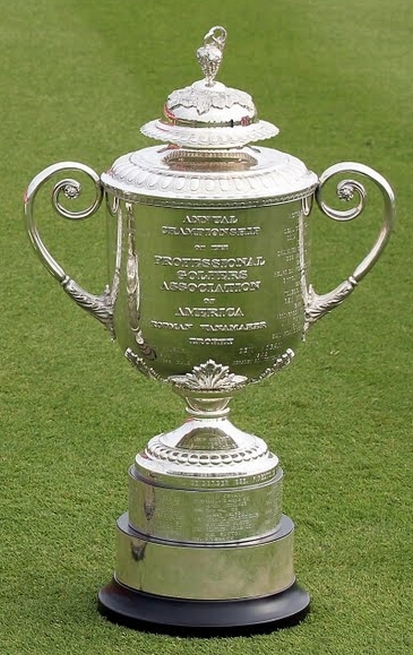 Mike A. was the only player to have both winner Brooks Koepka and runner-up Tiger Woods and won this week, with ease, his 2nd major of the year, finishing $740,091 ahead of Bill. Mike also became the first player to win 3 times this year. It was also his 5th cash of the year and 2nd in a row. In fact, all 3 players who cashed this week got their 2nd cash in a row. For the first time in a long time the Unofficial results were different from the Official results. I used last year's purse amount and distribution, since $10.5 million was the announced purse before the tournament (same as last year). But the PGA of America found another $500k and changed the distribution percentages. Using last year's purse Dan finished 2nd about $7,000 ahead of Bill. But with the new, and official, distribution Bill finished 2nd, a mere $72 ahead of Dan. It was Bill's 3rd cash of the year and first cash in a major since the 2014 British Open. Dan's 3rd place finish was his 7th cash of 2018. Brian G. ended up on the money bubble, $221,588 short of a cash. Andrew stayed in 1st in the Summer Season pool. Bill came up 2 spots to 2nd and trails Andrew by just under $855k. I stayed in 3rd and am around $144k behind Bill. Hugh fell 2 spots to 4th, a bit more than $33k short of me. Andrew still has a solid lead in the "TMC" pool. He leads Bill, who came up from 4th to 2nd, by $1,210,379. I stayed in third, $117,569 behind Bill. Jordie came up one spot to 4th, $208,380 behind me. The last tournament of the year will decide this race. In the Year-Long pool, I held on to 1st and lead Andrew, who didn't change position either, by $337,022. Dan moved from 5th to 3rd and trails Andrew by $252,871. Brian G. stayed in 4th, $59,333 behind Dan. Six players are within $1.2 million of the lead. Rest up, because after this week off we will finish the year back-to-back in the first two Fed-Ex Cup events. The next tournament in about 10 days will be The Northern Trust Championship at Ridgewood C.C. in Paramus, New Jersey. My apologies for having to play in New Jersey, but that wasn't really my decision. I hope everyone can handle the smell.